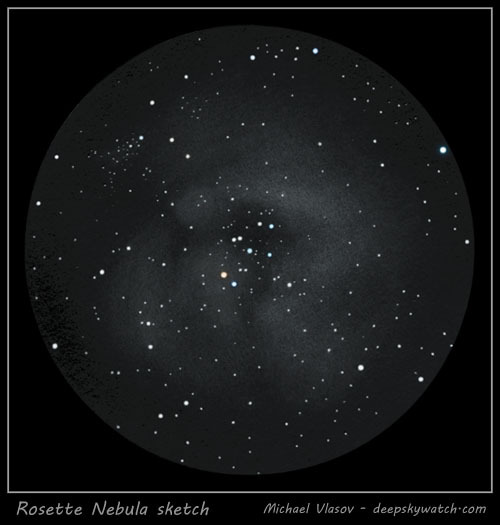 “Rosette Nebula” is a large emission nebula located in Monoceros, around an open cluster NGC 2244. This is a classic star forming region, where stars from the open cluster were formed from the nebula’s material. The cluster in the middle (NGC 2244) is very bright, and easily noticed with a naked eye under dark skies. However the nebula around it is a tougher target. It’s large, faint, and best viewed with moderate aperture and wide angle eyepieces (2.25 degrees field of view in this case). UHC filter helps a lot. The nebula has roundish structure, with diffuse and irregular edges. Under dark skies it reveals a complex structure, with a large “black hole” in middle of it, where the cluster resides. Most of it’s stars are blue or white, except the brightest yellow star on it’s edge (12 Monoceri). At the north-east (top-right in this drawing) there is a faint, elongated open star cluster NGC 2252. Object Type : Nebula (HII region) and open cluster. Location: Negev desert, Israel, ~6.6 mag. sky. Instrument: 200mm F/5 Orion (US) Newtonian, Hyperion 31mm, UHC, 32X, 2.25° TFOV. This is an excellent sketch of this famous and beautiful nebula. Especially nice work on the nebulosity. Excelent sketch of the nebulosity !!! Stars are all there. It is beautiful nice work !